You can watch the current lesson of Pastor Derek Morris’s Sabbath School Class on the HopeTV. It is an hour-long “an in-depth, inter-active study of the Word of God.” If you don’t have satellite TV, you can download the video (MP4) or audio (MP4) files and the lesson outlines (PDF) to your computer from the site. For Sabbath School teachers, this is an excellent example of how a good Sabbath School class should function. The video on the Hope Sabbath School Youtube Channel works very well on mobile devices. 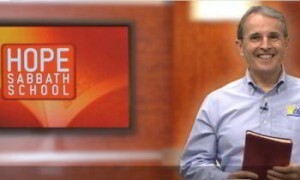 You can download the lesson outlines from the HopeTV Sabbath School Site. There’s a new app in the Google App store that features the audio version of the current Sabbath School Quarterly. It is called “Sabbath School Audio Quarterly.” We don’t know whether it is available on iTunes. Perhaps you can check and let us know. This is a Youtube Channel with readings of the weekly Sabbath School lesson. The introduction to Romans features the unmistakable voice of Sabbath School Lesson Editor Clifford Goldstein. We don’t know to whom the other voice belongs. Daily sections of the lesson have a short musical interlude between them. For those that have iTunes installed and are comfortable using it you can download and play the Adult Sabbath Sabbath School Podcast by Percy Harrold. If you do not have iTunes installed, there is a download button on the page. Essential for the vision-impaired and also great for busy people, these are playable on iPods, mobile phones and other podcast-supporting devices. Reading of the complete weekly Bible lesson, including the Bible texts, without commentary. We are pleased to share that the weekly Sabbath School Lesson podcasts by Percy Harrold are now also available at Hope Channel. Daily Lesson Portions in MP3 Format available from the Audio Services of Christian Record Services for the Blind. This is the direct link to the Sabbath School Lessons: “The Student.” There you will see links to the current Sabbath School lesson quarterly as well as previous ones. Reading of each day’s Adult Bible lesson, including the Bible texts, without commentary. Each file plays for about four and a half minutes and is around 3.5mb in size. Downloadable as MP3 file, or playable through your Windows Media player. Collegiate Quarterly Podcasts Daily reading of the Collegiate Quarterly Bible Study Guide available as podcasts or direct MP3 downloads, typically less than 4 minutes long. More than 300 Audio Bibles ~ available for free download in many languages ad versions. Audio Bibles for the Blind ~ available for free download or by mail in several different formats. Talking Bibles International – has Bibles in many languages, more for the New Testament than the Old Testamen. Adventist® Mission Video Podcast What’s the Seventh-day Adventist® Church doing to share Jesus with the world? Find out through the Adventist Mission podcast, a free video podcast delivered right to your computer. Each video brings you to frontlines of mission, face to face with people telling the world about Jesus. Sign up now for this inspiring podcast using the buttons below. The app gives access to print content from Beginner through the Adult Bible Study Guide. It provides links to all lessons in PDF format, which are downloaded when you click on them. Also included are the Kindergarten and Primary audio podcasts, the Kindergarten animation podcast, Sabbath School Leaders can discover ideas in Cool Tools and access the Sabbath School Manual right from the app. The app is available for free in the iTunes app store or at the Android app store.